A photo of Kevin Spacey, dressed as "House of Cards" character Frank Underwood, on the D.C. metro to promote the Netflix series. 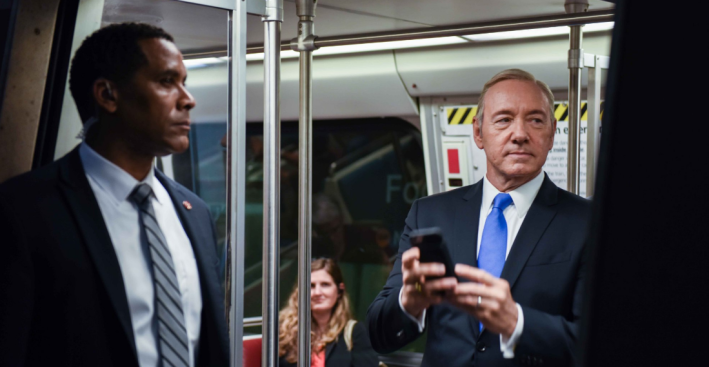 Actor Kevin Spacey appeared on the Washington metro as his "House of Cards'' character, Frank Underwood, to promote the Netflix political drama. Spacey was photographed Monday at Foggy Bottom-GWU station by real-life former chief White House photographer Pete Souza. The appearance was meant to drum up interest for "House of Cards'' season five, which debuts May 30. Metro later tweeted a photo thanking "President Underwood'' for taking the rail system. Last year, the show erected fake presidential campaign ads on Metro platforms and inside train cars. Spacey told the Associated Press that he believes season five is "one of the best" they've done yet and his Frank Underwood is just as backstabbing and deceitful as the other seasons. "This year, in particular, there's been a lot of commentary about how we can't compete in the real world, so it's not going to be as interesting and the show can't possibly be as crazy as the real world. And my answer to that is, just you wait," Spacey said with a smirk earlier this month. "Just you wait."